How brainy are humans compared to other animal species? One measure of intelligence in mammals is the ratio of brain size to body size, called the encephalization quotient or EQ. By this measure the human is a seven and the cat is a one. Our closest cousins, the chimpanzees are a mere 2.3 and between them and us are the bottlenose dolphins at 4.1. 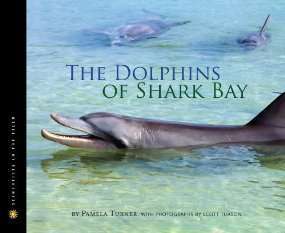 I learned this information from The Dolphins of Shark Bay by Pamela S. Turner with photographs by Scott Tuason. This latest contribution to the "Scientists in the Field" Series for young people is a fascinating introduction to the "Jane Goodall" of dolphin study, Janet Mann, who has spent the past 25 years studying the dolphins who live in Shark Bay, Western Australia. How does she know that they're smart? For one thing, they use tools. A chimp might use a stick to poke a termite nest but dolphins spend more time using a tool than any species other than man. They protect their rostrums (the front part of their "beak") from abrasion by covering it with a sponge when foraging for fish at the pebble-strewn bottom of the bay. They are also extremely social animals in a complex society. And their clicks and whistles indicate a high level of communication with each other. What does it take to study dolphins in the wild? A boat, diving equipment, a system of labeling and timing dolphin behavior, powerful binoculars, and lots and lots of patience. Years of doing this has allowed Janet Mann and her colleagues to identify and follow individual dolphins in the group and to learn their personalities. The reader gets to know that Puck is gentle and friendly, and that Nicky can be selfish and nasty; that there are different cliques of dolphins hanging out together and that there can be falling outs among friends. Survival in the wild, especially one where danger lurks in the form of predatory sharks, requires high intelligence. Supporting a calf and finding a mate involve complex skills. Janet's work has shown how survival behaviors are learned and passed down generation after generation to the point where she is asking questions like "Is there a dolphin culture? Are the dolphins of Shark Bay culturally different from dolphins in other parts of the world?" This is yet another opportunity for me to be an advocate for children's nonfiction literature. The accessible and lyrical writing of Pamela S. Turner opens one's eyes to the life style of scientists who spend lots of time outside, on the water and beaches of a beautiful part of our Earth, making discoveries about remarkable creatures. The Dolphins of Shark Bay is not just for children, but for anyone who still retains youthful curiosity about our world. It made me search out and watch a BBC video on the same subject. It is yet another opportunity to discover why scientists LOVE science and why top nonfiction authors LOVE research.